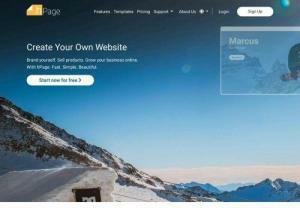 HPage is a free website builder that allows businesses, professionals, bloggers, and organizations to create their own website easily. Users can select from over 300 awesome design templates, use features like guestbook, sitemap, contact form, member area, password protection, etc. For their websites, own a domain, create e-mail addresses, and much more. Over 10 years in the market, more than 2 million websites have already been successfully created with hPage.